Latest Meg: 359 saw the last episode of Angelic. In many ways Rennie’s spiritual home, I can’t imagine he won’t have new stories in the Meg in future, too. I’m hopeful at least for more of his creator-owned Man from the Ministry. -not including his always entertaining rant-column from the Megazine, or his extended run on DC comics’ ‘Dredd: Lawman of the Future’ series. Which I’ve not read a single issue of. This story, featuring Satanus, was not authorized by Pat Mills. Never mind. It was fun anyway. Phew! That’s a long list. and it’s worth noting that he has done a fair bit of work with Dredd’s supporting cast, in particular Guthrie and Giant, two of the few Judges to get a whole Judge Dredd story to themselves in which Dredd himself never appears. This is the story where the bad guys were George Clooney and Vin Diesel. See also Angelic, another Dreddworld spin-off. A merry bunch of one-offs, especially Pulp Sci Fi. The entire cast of Caballistics, Inc (one of 2000 AD’s strongest ensemble casts, ranking right up there with the ABC Warriors). If I had to pick standouts, it’d be Chapter and Verse. I mean, the name alone is glorious. Rafe – somewhat forgotten these days but a rare headlining female character for the Prog. Planet Gary – a location rather than a person, but no less a character. An interest in religion; a bigger interest in Forteana – weird happenings, the occult, gothic horror - and films/books/comics based on that wide-reaching realm. Meta commentary on the same. Harry Houdini and Arthur Conan Doyle meet Charles Fort. It's high concept, innit. The crying 'Morrison' is Robbie, not Grant. R. Morrison being noteworthy for writing tearjerker Dredds. Rennie put in some hard graft on his way to being one of Tharg’s go-to writers. 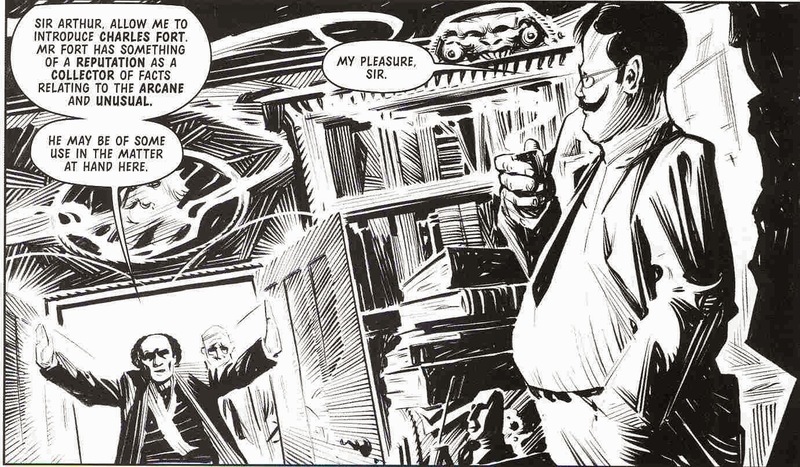 He started out in the Megazine with Missionary Man, had a go at a handful of Dredd stories there, got his foot in the door at 2000AD through a host of Vector 13s and Pulp Sci-Fis before finally getting a chance at longer series such as Witchworld, Rain Dogs and Glimmer Rats. Eventually - I’d argue with the arrival of Necronauts – Rennie became one of Tharg’s premiere script droids. He went on, rather rapidly, to produce top work on the return of the original Rogue Trooper, faultless Dredd stories (both single episodes and longer stories), and scored hit after hit with new series, from Storming Heaven to Caballistics, Inc and spin-off series Absolom. 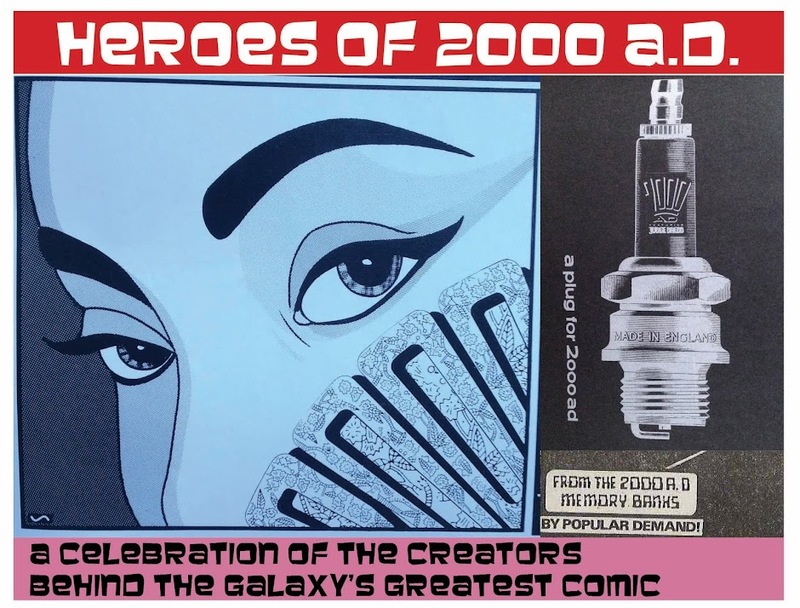 Not to mention Aquila, Jaegir and, most recently, Survival Geeks (co-written with Emma Beeby) - one of just a handful of strips that have graduated from a one-off into a recurring series. He’s not short of imagination or drive to produce new work! Bet let’s go back to the beginning. 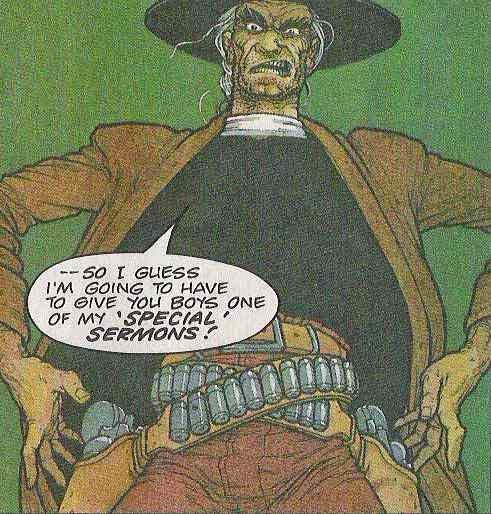 Rennie’s first series, Missionary Man, hit the Megazine at a time when the quality of that publication was, shall we say, a little inconsistent. 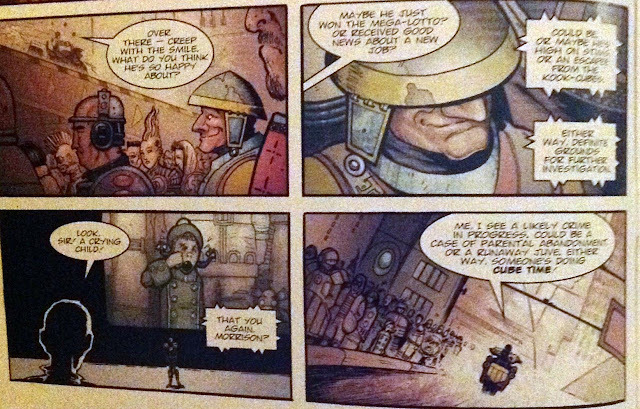 Speaking for myself, I didn’t really understand the strip at first, although I loved the Frank Quitely artwork. What if a corrupt Judge found religion, repented of his sins, and then proceeded to live as if God was on his side? Furthermore, what if God really exists, and actually IS on his side? This explains both Cain’s motivation, and also why he can’t be killed. (And at one point, the dude is poisoned, shot multiple times, drowned and trapped in a cave - all at the same time!). 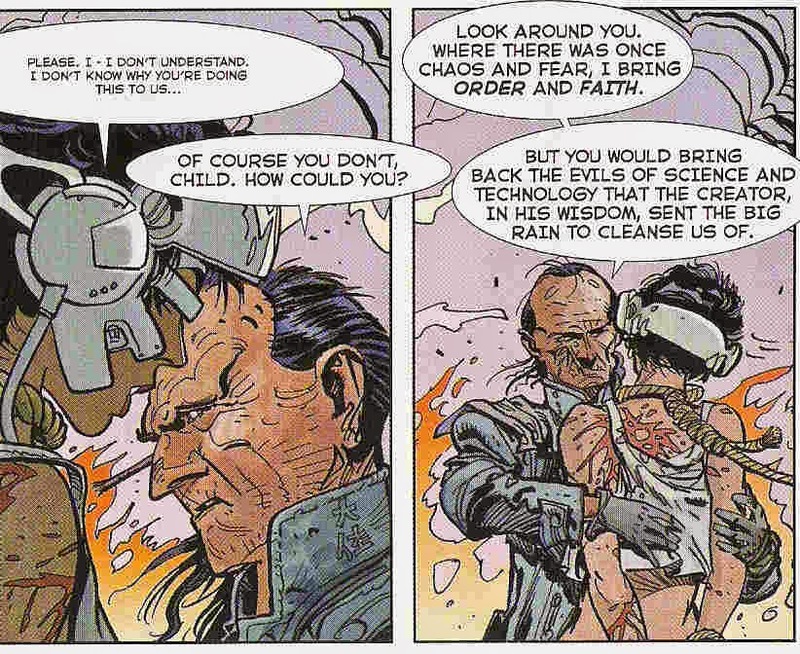 It also gives Rennie an excuse to mix ultraviolence with Biblical language, a natural but, within the Prog, unique fit for 2000AD. It ends up a winner. Still, the series took time to hit its stride, I feel. Ignoring authorial intent again, one can explore Rennie’s further stories in a similar vein. Glimmer Rats was, perhaps, more fun to think about and look at than to actually read. You’ll notice I haven’t attempted to come up with a pithy summation of every story Rennie has concocted. This is partly because I’m not clever enough, but mostly because the man himself is more versatile than that. The likes of Witch World and Rain Dogs may not be much celebrated, but both are perfectly decent works of genre fiction, as are the justly celebrated Glimmer Rats and Necronauts. (Although I would say that these last two examples benefitted enormously from having exactly the right artists to bring their worlds to life). Newer ouput such as Jaegir, Aquila and Absolom show Rennie being, I think, more interested in character than setting. Katalina Jaegir and Aquila, the characters, are essentially noble people caught up fighting on the wrong side (I’m painting both the Norts and the Romans as villains here. Not too controversial I think?). The plots for individual stories build from there, rather than the other way around. Absolom is more the classic ‘gruff old man with a noble past he’s trying to live down’ vibe. It’s brought to life partly by enjoyable plots that continue to explore Rennie’s obsession with old British SF/horror, but benefits from a stream of fun side characters, too. He’s another writer in the Mills/Wagner vein that makes it look easy to just throw new characters into a story to see what happens. I’m really sure it’s not easy. I don’t know where the likes of Cursed Earth Koburn or Bato Loco fit into this ill-thought-through scheme of mine. Both are occasionally recurring characters that grew out of a one-off Dredd; both are compelling enough that I’d happily read more. 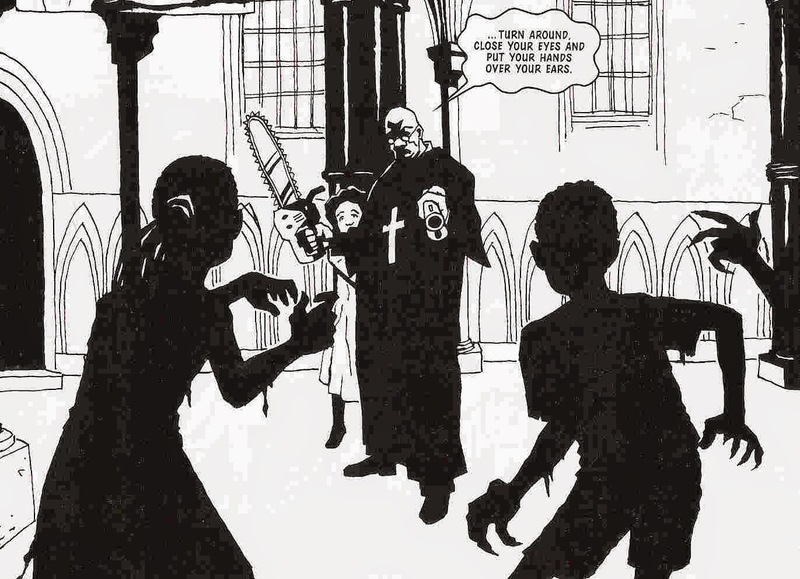 Like Pat Mills, however, Rennie does seem to have a tendency to dash off characters only to leave them in the wind, his mind focussed on newer things. Keeping on keeping on, Mr Rennie. 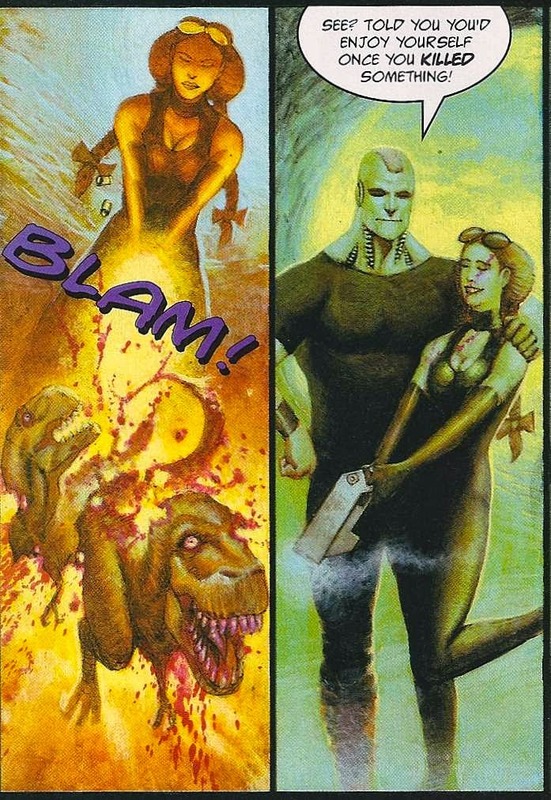 Rogue Trooper: the Realpolitik collection, (90% Rennie), is some of the best Rogue Trooper going. *Aquila is clearly a loose update of the old Tornado hero Blackhawk – even down to the 2000AD revamp where he loses his soul – but the emphasis is on the word ‘loose’. The series feels sufficiently different that I’d class this as a Rennie creation. But I’d be curious to know if he pitched it cold, or if Tharg put out a call for writers to pitch series based, however vaguely, on thrills past.